who should beast boy be with? Who do u think is better? Who do u think would be a better couple??? Why do people pair raven with Aqualad??? ok ok ok, i love BBRae heres the vraag if they had a kid what would it be named and would it be a boy of girl? Why do people sometimes pair up Speedy and Aqualad? It's weird! Please speak up of tell me why! WHY?! WHY?! This is my opinion. I was inspired door a video on YouTube, so don't ask. Everyone is paired up with everyone they possibly can, and the toon sets up couples, too, so we have to learn as we go. kyd wykkyd teleported from room to room to figure out a way to be distract the titans long enough to set up a trap to capture them and bring them to the figure. hmm where is everybody ? "NO WAY DUDE!! , u CHEATED !!!" beast boy shouted somewhere in the living room. "NO , I DIDN'T!!! u CHEATED!! " cyborg yelled back. kyd walking towards the living room and saw beast boy and cyborg playing with their game control fighting over who's the winner in the racing game. bobby walked over to the other titans with mevin over his shoulder. cyborg walkd over to them "yo melvin where's raven"? "oh she's talking to a silent guy that can't talk" she explained "silent guy"? beast boy asked. jinx eye wided with the name silent guy "wait a minute, did he happened to wear a bat costume and has red eyes door any chance?" "yes " melvin responded "it's kyd wykkyd" jinx told her teammates "hold up y'll i think i remember him yeah" cyborg said. "how"? robin asked." Speedy and Cheshire were trying to be apart for at least one day. Speedy:This is harder than I thought.I really wanna kiss Cheshire right now. Aqualad:Come on,you can do this.Just stay in your room. (quietly)In solitude. 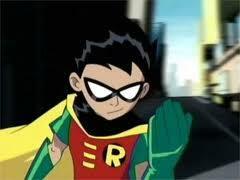 Aqualad(normal voice):I'm gonna play with Beast boy and see if I can keep Raven off my back.See ya. After Aqualad left Speedy goes into his room. Cheshire:I miss Speedy so much.I wanna kiss him. Cheshire:I wonder why Speedy likes me.Is it because he likes my personality,or because I'm cute?I'll ask him later. Cheshire gets out of Speedy's room and escapes Titans East without being seen. Speedy:I'm gonna see Cheshire now,okay Aqualad? Cheshire:I'm sorry about Red X, Speedy. Speedy:That's okay.I can't stay mad at u if I tried. Cheshire:Let's have a night out together. Speedy:Sounds good.Where should we go? Cheshire:We should go to the movies.They have a discount on popcorn and soda. Speedy:I love u Cheshire.I think you're so cute. Cheshire: I think u are,too. Speedy:I should go back to Titans East. They may be worried that u killed me of something. Speedy and Cheshire were trying to find a spot to kiss. From a bush,Red X,who secretly liked Cheshire,watched Speedy. Cheshire:I think someone's watching us. They were at the movie theater. After the movie,they went to a campsite. Cheshire:This place is really nice,Speedy. Speedy:Thanks.Can we kiss?Nobody but us will know. Cheshire:Can it be in the tent?I like it. It was morning and Speedy was talking to Aqualad. Aqualad:Are u sure Cheshire's the right girl?She almost killed you. Speedy:I'm sure.She thought I wanted to fight then kissed me! Aqualad(with singsong voice): She likes you!She likes you! Speedy:Well it's my turn to get groceries.I'll be back later. Speedy was walking to the store when he seen Cheshire again. Speedy and Cheshire lean in and kiss each other. a pop quiz question was toegevoegd: what are Starfire & Robin doing in this picture?